Paddy is processed in 3 main forms a) Raw Paddy, b) Steamed Paddy and c) Parboiled Paddy. All the three forms can be consumed as brown rice or white rice. The poor cooking quality of new rice makes old rice sell at a higher rate than new rice. New paddy if steamed and held hot for sometime and then milled gives very good cooking characteristics. The cooked rice appearance is like old rice in which the grains are fluffy and non-sticky. Thus paddy is steamed. Freshly harvested paddy has moisture around 18 – 24% wb . This paddy needs to be cleaned ( by sieving, aspiration and magnetic separation) to remove dust, chaff, tags, nails etc. and then its moisture needs to be reduced to around 12% wb before it can be steamed. It is necessary to condition the paddy to around 12%wb moisture to get good steamed rice. Steaming at higher moisture would result in “suppressed parboiling” resulting in product with partial parboiled appearance. Steaming of cleaned conditioned raw paddy is carried out in KILBURN continuous steaming tank. By balancing the feed and the discharge rate steady state operation is achieved. The output steamed paddy temperature is monitored with a RTD with digital display. The steamed paddy is then held in insulated holding tanks before it is dried. The steaming time temperature determines the colour & cooking characteristics of the milled rice. Two holding tanks are used one would be filling and other discharge. 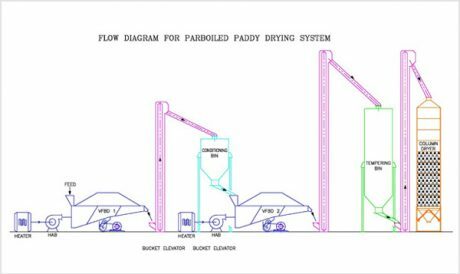 The output steamed paddy would have higher moisture content than input raw paddy and thus needs to be dried before milling. 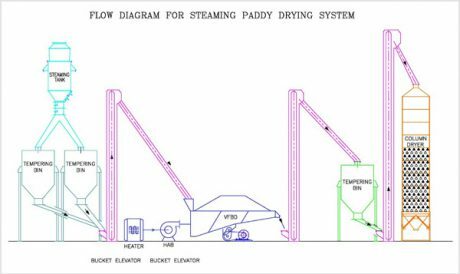 Steamed paddy can be dried in batch mode in column dryers or in continuous mode using VFBD – Tempering Bin – Column Dryer combination. • Steam loss is minimal as this is a closed system operating under steady state. – Holding time: residence time can be easily fine tuned & qualified as per requirement. Parboiling or partial boiling is a hydrothermal treatment of paddy with an objective to gelatinize the starch without affecting the shape and form of paddy. Parboiling conventionally is “presteam – soak – Drain – Cook – Dry” process involving both water and steam. Properly dried parboiled paddy would give much less broken than raw milled paddy for any given paddy sample. Parboiled rice bran has higher oil content than raw rice bran. Milled parboiled rice has higher Vitamin -B content than milled raw rice. New parboiled rice has much better cooking characteristics than new raw rice. Parboiled rice is suitable for making puffed rice for which raw rice is not suitable. Cleaned & conditioned paddy is subjected to dry saturated steam followed by soaking for a desired time, temperature. The water is drained and the paddy is then steamed to gelatinize the starch. Constant Rate Period :- The rate of water evaporation and the paddy temperature remains constant with time. In this period the grain surface is wet and evaporation takes place from the grain surface only. All the heat of the drying air is used to remove the surface moisture. Falling Rate Period :- With time, after all the surface water has been removed, water diffuses from the core to the surface and then evaporates and the rate of drying decrease with time, as it is controlled by rate of diffusion of water from the core to the surface. The transition between constant & falling rate is called critical moisture which is round 18%wb. The rice grain is susceptible to cracking only below critical moisture content, where, if the drying rate is too fast it becomes a serious source of cracking. Moisture evaporates only from the surface; so the moisture from the inner layer first diffuses to the surface and then it evaporates. This process therefore sets up a steep moisture gradient in the grain, as the surface being excessively dry and the core still wet, this results in moisture stress and the grain releases the stress by cracking. KILBURN has devised a system to properly dry the grain to the desired moisture by way of gentle handling. The recommended combination for Drying Parboiled Paddy is : KILBURN VFBD + Column Dryer. 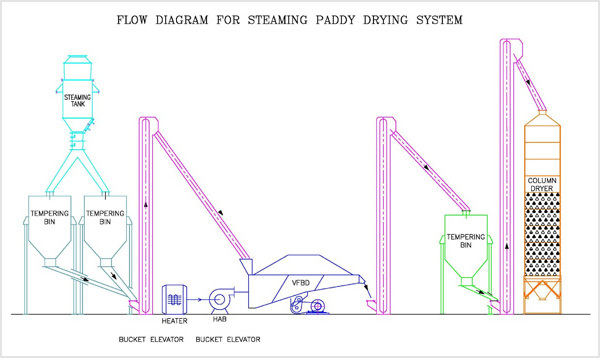 The wet parboiled paddy is fed into KILBURN vibratory fluid bed dryer. Hot air is passed underneath a perforated tray carrying the paddy. The paddy is effectively fluidised by a combination of hot air and vibration. Paddy is dried to around 25% wb in the first dryer. Almost fully saturated exhaust air is thrown out by exhaust system. Paddy from the first VFBD is sent to Conditioning Bin for equalisation of moisture. Conditioned paddy is then fed into the second KILBURN VFBD where partially dried paddy is dried at low temperature to moisture of around 18% wb. Paddy from the second VFBD goes to tempering bin from which it is fed to the column dryer (s) where paddy is dried to moisture of 12 -13% wb before milling. Would you like to Get Quote for our Paddy Dryers?